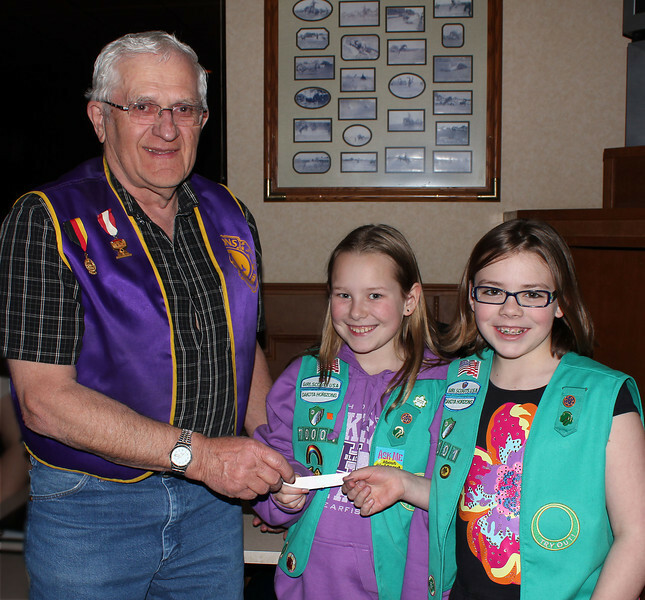 LIONS SUPPORT SCOUTS "OPERATION TASTE OF HOME" Lions Club treasurer Rich Drabek presents a $50 check to Junior Girl Scout Troop 70001 of Belle Fourche for "Operation Taste of Home" during the February 28th, 2013, Lions meeting. Accepting the check are scouts LeeAna Best (center) and Seyara Sechser (right). The money will allow the troop to send a case of Girl Scout Cookies to military personnel serving overseas. The Junior Girls Scouts also use money collected from cookie sales for a variety of community service projects -- like the "Pretty the City" project that provided for the planting of flowers at Herrmann Park. This year, they hope to help plant more trees along the River Walk.